It’s time to find your favorite football party recipes, Super Bowl Sunday is just around the corner and do I have a “Touchdown” appetizer for you. (Pun totally intended). 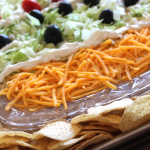 This Game Day Taco Dip is a simple throw together snack that is sure to make any football fan cheer. Gosh…. I’m sorry the puns are already out of control. Should we consider that a “False Start” or a “Delay of Game”? I love football in general, but tend to watch more college games. Mostly because, in our area there is no “official” NFL team. We are smack in the middle of Chiefs/Packers/Broncos/Bears/Vikings territory. And because of that, I usually find myself just cheering for whichever NFL team roster is host to a past Husker player. 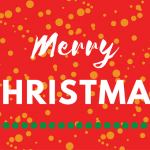 But…. the Super Bowl is never missed in our house. Between delicious food and the Budweiser Clydesdale commercials, the actual football game sometimes gets pushed into the background. 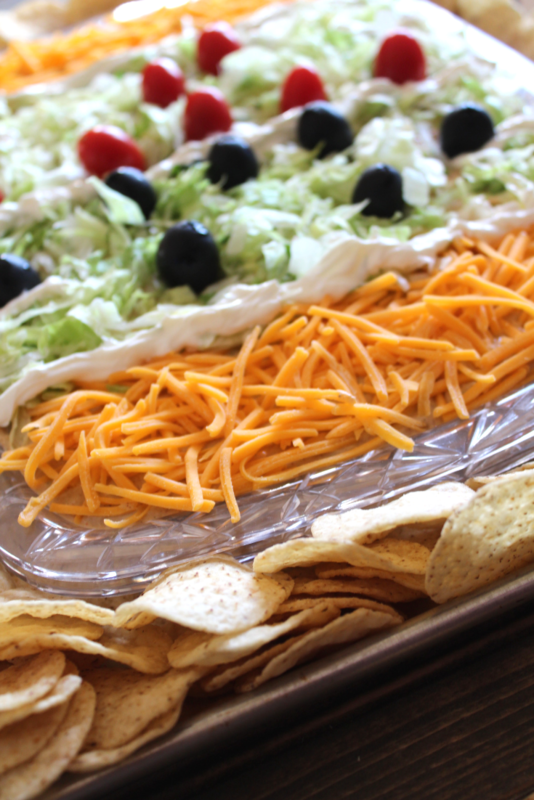 Who can blame us when this delicious taco dip gets brought to the table. 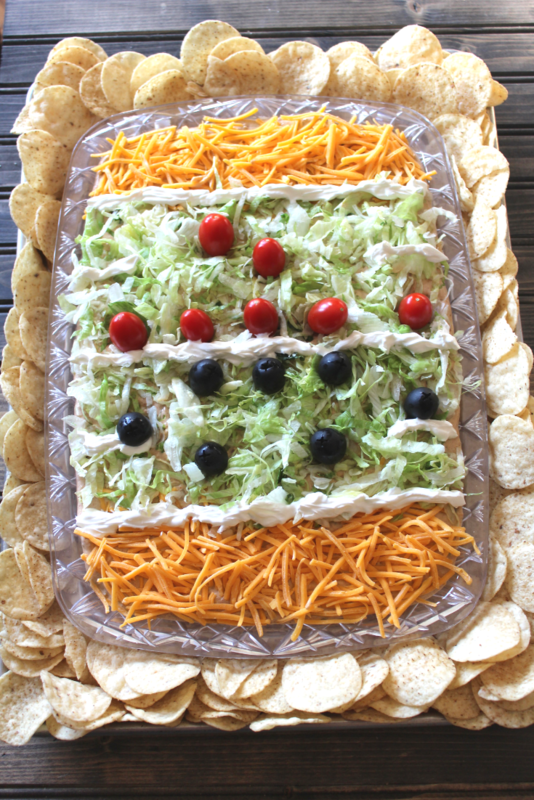 Dressed up to look like a football stadium, it’s a tasty and festive app for any party. 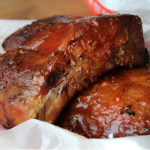 Serve along side these Fall Off The Bone Slow Cooker BBQ Ribs, Grilled Jalapeno Poppers With Bacon, and Best Burgers Ever! 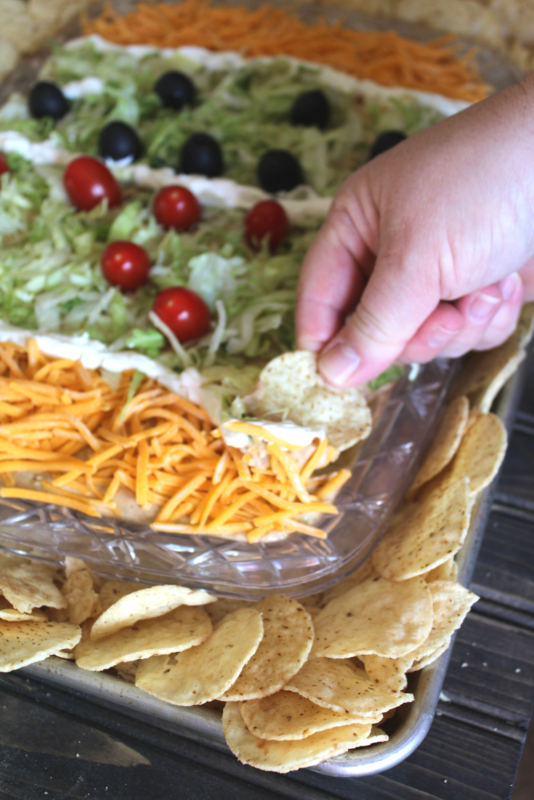 for the perfect game day spread. In a bowl combine: refried beans, taco seasoning, sour cream, and guacamole. Spread into a 8×10 inch dish. Top with cheddar cheese, lettuce, olives and tomatoes. 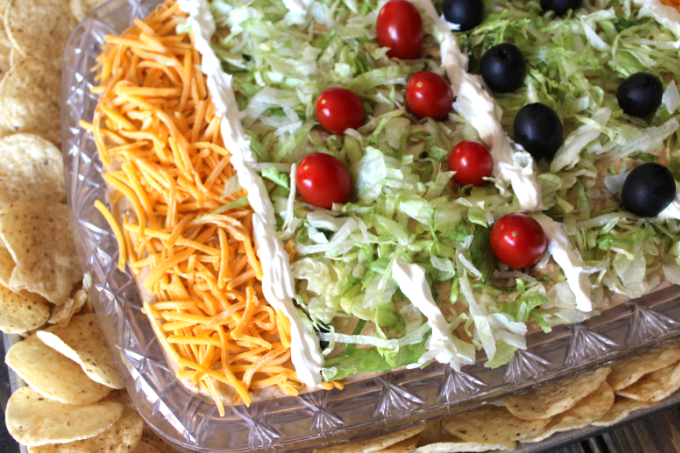 For football stadium appearance: Use shredded cheddar cheese for “end zones”, add the green lettuce to the middle of the dip for the “field”. Then add the “yard lines” with extra sour cream. Put your “players” on the field with the addition of the black olives and tomatoes. Finally place your field in the center of a large rimmed cookie sheet arranging the tortilla chips around the dish to look like the “fans”.